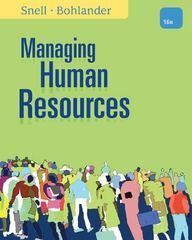 Managing Human Resources 16 Edition Gain a better understanding of how human resources impacts both individuals and organizations with this market-leading, practical text. Snell/Bohlander's popular MANAGING HUMAN RESOURCES, 16TH EDITION builds upon a foundation of research and theory with an inviting, practical framework that focuses on today's most critical HR issues and current practices. The book's engaging writing style and strong visual design use more than 500 memorable examples from a variety of real organizations to illustrate key points and connect concepts to current HR practice. Fresh cases spotlight the latest developments and critical trends, while hands-on applications focus on practical tips and suggestions for success.